The daffodils have made it home!!!! I can't write as well as Cara, but I've got a great story to tell... This painting is by Arkansas artist, Patrick Matthews, whom I have admired and followed for at least a decade. I have wanted a painting of his for years, and promised myself that "one day" I would be in a position to purchase one. I signed up for emails of his works and received them three or four times a year. I would scroll down the pages and be thrilled by each painting each one more than the one just before. On Feb. 3rd came the latest email. This time his work was being auctioned off by Waxlander Gallery in Santa Fe. I started my scrolling and low and behold the daffodils jumped off that page!!! I couldn't believe my eyes!!! You see it was meant to be!!! That was THE painting that I had been waiting to buy!! And why daffodils you are thinking? They are my connection to Tippe. It was our flower. And look, isn't this a painting of Wye Mt.? That has a funny family story of its own. Long story short... I bid on the painting Feb. 3rd. The auction ended on Feb. 9. I won the bid. It shipped out last week. I received it today... Cara's going home day. Tippe and God knew I'd need a daffodil today, and they found a way to send me some! "We Love our Painting by Pat Matthews. What a family heirloom"
I fell in love with your daffodil painting the first time I saw it, and when I showed it to my husband he loved it too. It is such a happy painting full of color and detail, and the daffodils on Wye Mountain are a well known beauty and sign of spring. The painting hangs over our mantel and the lights above it are the first lights turned on in the morning and the last lights turned off at night. "Thank you Chrissy and Rob for commissioning my work. It looks great at your condo in Beaver Creek, Colorado." Lovely to chat with you in town earlier today. 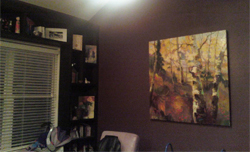 Attached are a few photos of one of your Aspen triptychs which adds warmth and energy to our home. We decided not to frame the canvases, to retain the edginess and youthfulness of the artwork, and in contrast to some of the heavy bronzes we have on display. We love it! Also attached is one of your playful USA flags. Perhaps one day we can convince you to paint a Canadian flag! With best wishes for a successful weekend exhibit,"
We received the prints tonight and had planned on putting them side by side - but it just didn't look right, so they're on separate walls. The original looks fantastic and has already had several highly complimentary comments from the people that have seen it. I still have plenty of wall space to fill though! Thank you once again. " "The Cypress Trees that you did for me on commission go so well against the "Sinker Cypress" walls we have in our house in Oxford. Also, goes well with our friend George Rodrigue's "Blue Dog" in our elevator." "We are the blessed recipients of 5 of Patrick's glorious paintings! Each has a prominent place in our home and bring us much joy...as much as just knowing Pat and calling him friend brings us joy. We've kept ours un-framed as the movement continues beyond the edges of the canvas and allows the eye to travel the paintings from any angle in the room. A brilliant American Impressionist whose work we believe, will transcend the ages! "We just received the painting today and absolutely love it. We think it is now our favorite Pat Matthews painting. Thank you very much! Merlin decided to use the crate as his frame. It is very Merlin and very cool! Everyone loves it!" "Blue Ridge Waters is not only an amazing painting, but the perfect painting for our mountain home. Pat captured the beauty and serenity of the old mill wonderfully and we cherish this work of art. "My wife Heather and I were pleased to meet you at Paderewski gallery in Beaver Creek a few weeks ago. I attached a photo of the painting you did for us several years ago. We both love it and get a lot of compliments on your work. "I wanted to say again, how much I appreciate your help with my gift to Chris…He is such a special man and I know he will love it! Rarely, do I see attention to detail and the level of customer service you delivered…and with such graciousness! I have already shared my experience with a number of our agents and will continue to do so. Thank you for sharing your "gift" with Chris and I! Every time we look at the print, we will be inspired to GIVE the way you do… "
"The painting arrived! I have it and it is BEAUTIFULl!!! More beautiful than I was even thinking from the email photos. I tell people to surround themselves with things that make them smile, And Pat's painting makes me smile every time I look at it. Thank you so much. Hoping to get back to Beaver Creek in the future...I will stop in to see you. A very pleased customer. " "I just wanted to let you know I have enjoyed your art work for a number of years. 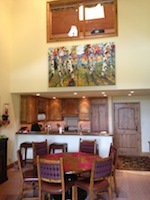 I purchased the paintings I have attached a number of years ago and for many years they hung in my house in Phoenix. I grew up in LR but have spent over twenty years living in Phoenix. We recently moved back to LR and the paintings are very happy in my home in the Heights. One of my four sons is in the SOAR program at AR Baptist and I am so thankful for your time and talent you contributed to this fundraiser. It is so appreciated and the program is making a huge difference in the life of my son and our lives as well. I look forward to following your work and seeing more of it here in Arkansas. Thank you again. " "We love our flower and heart paintings. We love them so much and they are very beautiful, and we are thankful to see them every day." "We love our painting by Patrick Matthews. It immediately takes into a viewpoint of nature that we never saw…colors and textures come together to show a beautiful aspen scene. The painting of the American Flag in our home by Patrick Matthews reminds us every day of how blessed we are….and the courage, boldness, and strength it took to keep us free. The tethered texture is so simply elegant and rings true to what our country has been through. This painting is truly evocative and wonderfully expressive. Our abstract painting is so full of expression and color, it brings the entrance to our house to life. "The “Fly Fishing on the Little Red River” painting which I have of yours, is proudly displayed in the living room of my vacation home in Shirley, Arkansas...which is on the Little Red. The painting is perfect in this setting."